Reviving a beaten wood cabinet can be hard, but with a thorough cleaning you can restore natural wood cabinets to their former glory. Also have laminate cabinets? 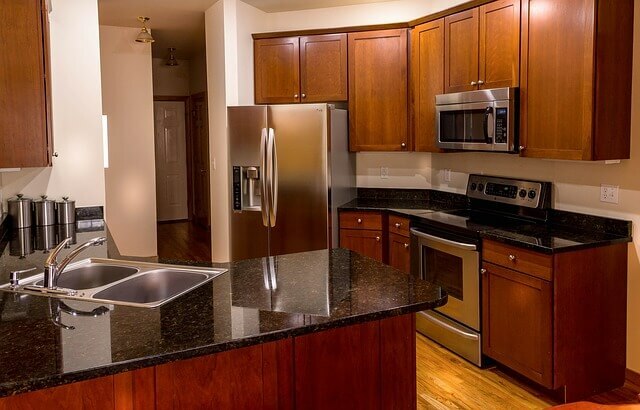 See our guide on how to refinish laminate cabinets in 10 easy steps! A good cleaning can remove dirt, grease and food residue. These blemishes hide the wooden cabinet’s brilliance and beauty. Below is a detailed guide on easily cleaning natural wood cabinets and achieving that brilliant shine. You should first start by gathering the items needed for the cleaning project. You’ll first need two buckets (preferably large ones). One bucket is for applying the cleaning solution; the other bucket is for removing the cleaning solution. You’ll also need a cleaner which works on natural wood. Pick a good cleaner that’s safe to use on natural wood cabinets. After this, look for a sponge* and another piece of cloth. Lastly you might be required to use a toothbrush to get into small openings on the wood. *Also avoid using rough tools like steel wool that may damage the wood. No matter the cleaner you choose, the steps for cleaning are the same. Begin by filling the first bucket with water and add your preferred natural wood cleaner. To get the ideal mix of water and cleaner refer to the instruction labels (most products have them). Warm water should be used to easily cut through grease stains. Fill the second bucket with hot water and put aside. Dip your sponge or rag in your first cleaning bucket and start cleaning your natural wood cabinets one by one. Softly rub the surface of your cabinet doors then open them and clean their frames. Move to the drawers and follow the same procedure, starting with the fronts. Proceed to open your cabinets and then wash the frames. Use the second cloth or rag in the second bucket to wipe the cabinets once more in order to remove the cleaner and remaining stains. Once you’re finished removing the cleaner, I recommend you use a cloth that isn’t already wet to wipe the cabinets. This ensures that no cleaner is left behind and also removes moisture that will harm the wood after getting into crevices. If there are upper and lower cabinets, you should begin with the upper cabinets because dirt may fall on the lower part of the cabinets when cleaning.